You may not realize it, but fall is the best time to start thinking about your trees. If you need to move them, it’s the best time to move them. If you want to plant new trees, it’s the best time to do that, too. Over the years we’ve written a lot of articles to help people with the trees on their landscape. This fall, we wanted to put all of them in one place so you’d have a handy reference guide to help you tackle your trees. How to Plant a Tree – As advertised on the tin. We take you through the best way to plant a tree in your Wisconsin yard. How to Remove a Tree Stump – Got a dead, ugly tree stump in your yard? Never fear. We’re here to tell you how to get rid of that thing in a safe, cost-effective way. Keep the Emerald Ash Borer Out of Your Yard – Emerald ash borer eggs hatch in August; if you’ve got an infestation you might be seeing the signs in September and October. Here’s what you need to know. Oak Wilt Season is Upon Us So Don’t Remove those Oak Trees – Sap eating beetles cause oak wilt, and they’re active well into October. 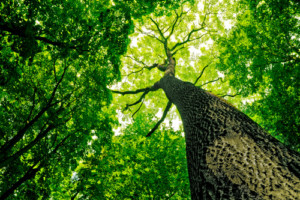 Find out how to protect your oak trees. Planting Birch? Be Sure to Plant the Right Variety – Planting the wrong type of birch can expose your yard to an invasive species known as the bronze birch borer. If you love birch, find out what’s safe! How to Reduce Road Noise Without Installing a Privacy Fence – Trees can help you reduce road noise. We explain which ones to use and how to make the most of them. How to Install Fences Around Your Trees – Don’t let rampant root growth ruin your fence. Find out how to make sure your fence and your trees get along just fine. Caring for Evergreens in November – We’re not too far from November, and so it might be a good idea to brush up on the care and proper feeding of evergreens. Can I Trim My Neighbor’s Tree? – Is your neighbor’s tree bugging the crap out of you? Find out what you need to know about dealing with those branches overhanging your yard. In addition to all the articles we’ve written we wanted to take a moment to share some local tree resources as well. New Tree Planting – A DNR resource to help Wisconsin residents give their trees the best chance of survival. Here’s how to get your hands on DNR tree and shrub seedlings. Wachtel Tree Care Science – A huge site full of tree care resources. Planting trees beautifies your property and helps the environment. It’s a great way to invest in your landscape this fall. We hope this round-up helps you show your trees a little love this season!